Fast ForWord’s language & cognitive enhancement programs accelerate learning and reading. They are based on over 30 years of neuroscience research, designed for home users, education institutions, English language learning centres, and clinical specialists worldwide. Just as a body runs better and quicker when fit, brains learn better after consistent use with the Fast ForWord brain learning exercises. The key is processing efficiency, and students around the globe are using the Fast ForWord educational software program’s to develop the cognitive skills that enhance learning, leading to academic success. It's easy to get started. Visit our shop to purchase a Fast ForWord program subscription. Further subscription details can be found below. Want to know if Fast ForWord is right for you or your child? Our support resources are available 24 hours a day, 7 days a week to all our Fast ForWord home users. Everything you need to know to get the best out of your Fast ForWord subscription is available on the help centre. You will find program manuals, score sheets and tips and suggestions on how to do the exercises. There are short, easy-to-follow videos as well as printable materials. The site also includes frequently asked questions, technical and program support. A parent who is able to provide support will contribute greatly to their child’s success and confidence. The value of this program and its scientific validity is based on consistent adherence to the recommended weekly participation. Without consistency, the brain cannot rewire and build the solid foundations it needs for learning. An initial Fast ForWord at home program subscription is for a period of 3 months. It starts on a date nominated by you (within a week of your purchase date). Most children are able to complete two language modules in 3 – 5 months (depending on length of the daily sessions) and many then choose to continue and complete a Reading module for further development of their skills. There are service levels to suit all needs. Fast ForWord Premium Plus is the subscription that provides the highest level of personal support. You have a dedicated LearnFast program specialist who will support you and your child throughout your subscription with weekly coaching sessions during business hours. Fast ForWord Premium Plus is ideal if you have limited time to supervise your child’s daily exercises, or if you would appreciate the highest level of personal support. Fast ForWord Premium is the subscription that most parents choose. It gives you access to the same exercises as the Classic or Premium Plus subscriptions. The program duration is 30 minutes per day, you have a 30 minute initial orientation session and 15 minute monthly coaching sessions with a LearnFast program specialist, so your child gets the most out of the exercises. You also have 24/7 support via videos and Q&As on our support website. If you are a parent, grandparent or carer who feels that extra support from a LearnFast specialist will help you and your child, then Fast ForWord Premium is ideal for you. Fast ForWord Classic is the most economical way to improve your child’s learning and reading. 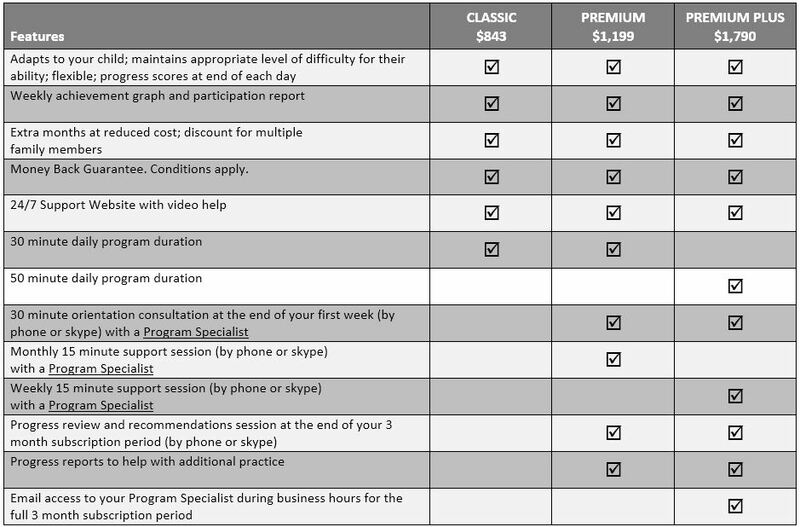 Classic gives you access to the same exercises as the Premium or Premium Plus subscriptions, and you have 24/7 support via videos and Q&As on our support website. If you are a parent, grandparent or carer who is able to monitor your child’s daily Fast ForWord sessions and keep them motivated, then Classic is ideal for you. Who can Benefit from Fast ForWord? Fast ForWord benefits everyone, children and adults, because it improves their learning capacity. Fast ForWord can be life changing for students and adults who struggle to learn and read. Fast ForWord accelerates English language acquisition for those learning English. Fast ForWord can assist those with diagnosed conditions such as Dyslexia, Auditory Processing Disorder, Attention Problems, Autism Spectrum Disorders as well as behavioural problems arising from poor classroom performance. How Does Fast ForWord Get Brains Fit for Learning? Fast ForWord simultaneously develops fundamental cognitive (thinking) skills and reading skills. Together, these skills improve learning and reading ability. Fast ForWord is a suite of online programs that exercise brains, the way physical workouts train the body to be fitter and stronger. Processing rate is the speed at which we can discriminate images and speech sounds and identify letter and word forms to create meaning. This is a prerequisite for phonemic awareness and reading. An adequate processing rate enables us to accurately perceive and manipulate information. Fast ForWord increases the speed at which the brain processes information. Sequencing is placing the detail of information in order (eg: days of the week). For reading, sequencing is the ability to determine the order of letters within words or words within sentences.This is a skill that relies on memory, attention and processing speed and is essential for phonics, word fluency, reading and oral comprehension. Fast ForWord improves the recognition of the order of sounds, letters, and concepts. Students who do Fast ForWord exercises develop and strengthen these four fundamental cognitive skills. When developed together, improve learning and reading. After participating in Fast ForWord students are better able to follow instructions, concentrate and participate in classroom discussions. They improve their reading, spelling and comprehension and find they enjoy school more. Their self- confidence increases which can lead to better behaviour and sociability. How Does Fast ForWord apply the Principles of Brain Science? Where can I do Fast ForWord? Fast ForWord can be utilised by individuals at home. Our specialist support and implementation team can quickly have your child using the programs, even in the most remote parts of Australia or New Zealand. Students do the Fast ForWord exercises five days per week until the exercises are completed. Many Schools and Specialist Clinics around Australia also use the program. Are there Results Published about the Benefits of Fast ForWord? Fast ForWord is the most evaluated technology-based learning and reading program in the world. See some of the Studies and read about LearnFast clients’ experience with the Fast ForWord program. Why is Fast ForWord Unique? Adapts exactly to each student’s development needs. Fast ForWord identifies the student’s individual learning weaknesses by analysing their responses to the exercise tasks and continuously adjusts the degree of difficulty to keep the student challenged. Provides short concentrated training that produces enduring learning gains. Students can make gains of up to 1 -2 years in reading competency and these gains are maintained without additional training. Is based on proven neuroscience research and is continuously validated by on-going research. Fast ForWord was developed from fundamental research by some of the world’s most eminent neuroscientists. Continuous studies of its use make it the most researched program of its type in the world. It is validated by independent researchers and accepted by the scientific community. Fast ForWord has been used by over 3 million students in over 40 countries since 1998. Fast ForWord delivers students much more intensive exercises. The patented Fast ForWord technology creates unique programs that rapidly impact a child’s ability to read and learn. In a 50-minute session, Fast ForWord participants are exposed to more carefully designed learning activities than participants in any comparable program. A team of leading neuroscientists, educational psychologists and educators developed Fast ForWord in the late 1990s. Since then it has been continuously upgraded and improved based on extensive user experience data, and further advances in the understanding of brain science. Does Fast ForWord Suit all Ages? Fast ForWord works for children from six years of age through to adolescents and adults. How Often Does Fast ForWord Need to be Done? Best results are obtained when learners follow their recommended protocol of between 30mins to 50mins per day, five days per week until complete. Everything you will need to know to ensure you get the best out of your Fast ForWord subscription is on the 24/7 Support resources website. This includes Frequently Asked Questions (FAQs), Technical and Program Support. There are also short, easy-to-follow videos and printable materials to assist you. When you purchase your Fast ForWord subscription, you have choices about what level of support you feel you need while working on the program. What are the Terms and Conditions of Purchasing the Fast ForWord Program? The Terms and Conditions for the Fast ForWord program can be viewed here. It's easy to get started. Visit our shop to purchase a Fast ForWord program subscription.